THE WRITING BUDDHA - Opinions | Books | Movies: Hidden Husband by Shikha Kaul (Book Review- 3.5*/5) !!! 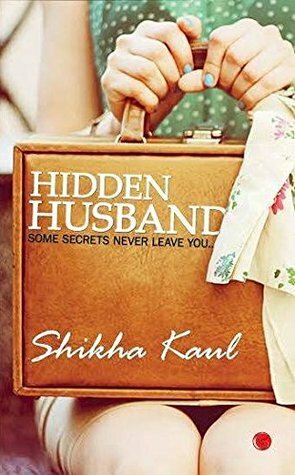 Hidden Husband by Shikha Kaul (Book Review- 3.5*/5) !!! I am done reading Gargi Publisher's one of the latest release- debutante Shikha Kaul's "Hidden Husband". The book also carries a tag line- "Some secrets never leave you". The cover page of the book is so beautifully made that it will tempt you to pick up the book. The same happened with me. I had very big expectations from the book considering its whole representation and synopsis but I found the book little above par. Shikha Kaul's writing style is simple and it will not make you reach out for your dictionary even once. Her characters are also memorable and you will find connecting with each of them very easily. Her approach of writing this book by keeping things simple and realistic can be easily deciphered but it also limited the author's imagination. The book starts wonderfully and asks you to sit and dwell into the story. Few early pages are really page-turners and you want to read the story as fast as you can to know what will happen to the new developing love story. Suddenly, author takes you to a flashback and surprises you with facts about the protagonist which confuses you how can then a new love story is about to start in the present. When the author comes back to the present, it is again where the book flies high and your interest gets generated again. Author have written the initial part and anti-climax and climax very beautifully which shows her real talent. Unfortunately, the same flick couldn't be found in the 2nd part of the flashback that is the core part of the book. Shikha Kaul's characters and their dilemma somewhere makes you remember Preeti Shenoy's characters. This impressed me a lot as you couldn't point any of the characters and claim that he/she is wrong or villain of the book. Coming to the drawbacks:- I found the flashback stretched and felt that author could have easily cut it short by almost 30-40 pages. Yes, that's how much stretched I found it. Also, few things are repetitive which makes you lose your interest in the later stages. The over description of few things irritates the reader. Also, author discusses few current affairs and her take about it through the voice of her protagonist. As they had nothing to do with the plot of the story, I found it totally irrelevant. The book could have been easily wrapped up in 200 pages. Overall, I will give the book- 3.5* out of 5 and I am pretty sure that author is about to get better with each of her book as she has the quality that will make readers feel connected with her.